Last Memorial Day weekend, while the rest of the country was enjoying the roar of the Indy 500, screaming crowds at the NBA playoffs, or just noisy families, I was sitting in complete silence – by myself. Three nights and nearly four full days, with much of that time sitting on the bench you see in the photo above. Regular readers know I work hard at cultivating a process of personal reflection, and I’ll take a couple days a few times a year to get away. 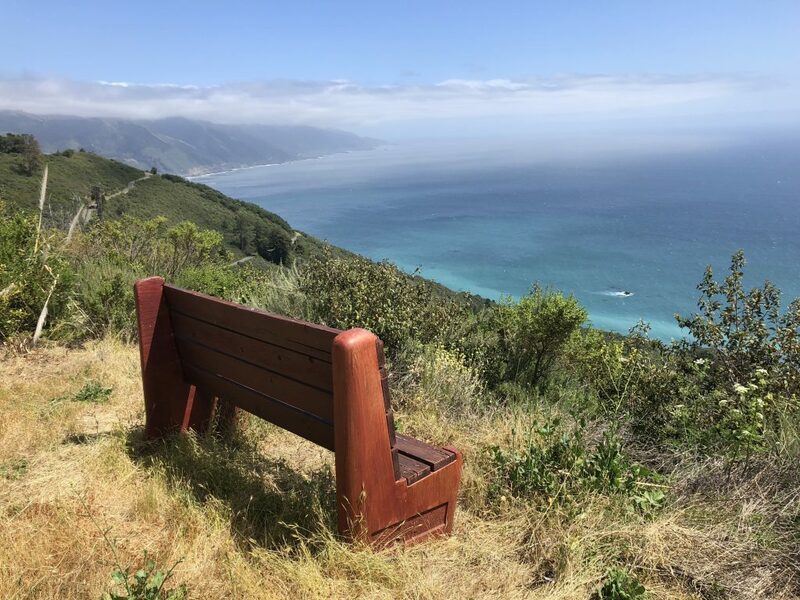 This past weekend, on fairly short notice, a “room” opened up at the New Camaldoli Hermitage, a Benedictine monastery only about 50 miles north of me on the dramatic Big Sur coastline of California. 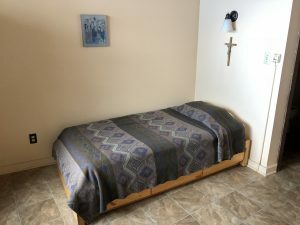 It wasn’t my first time at a monastery, but it was the longest stay – and the first one where total silence was required of the dozen “retreatants” that stay with the fourteen monks. Total really means nearly total. If you want to speak with a fellow retreatant, you head down the two mile driveway to the Pacific Coast Highway. After just a few hours I removed the battery from the clock in my room as the faint tick-tock was unbearable. 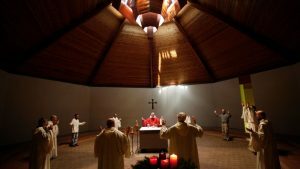 The only human-created sound is the church bell that rings before prayer services four or five times a day beginning at 5:15am, and you can attend to hear the monks chanting the Psalms. I did several times as the spiritual energy puts some aspects of life into perspective. You can also request spiritual guidance from a monk, which would be verbal while in a private room. I did, as I’ll describe below. I put “room” in quotes because the accommodations are decidedly minimalist. A tiny room, single [very hard] bed, desk, and a half bath. You share a shower. The monks provide one cooked meal each day at noon which you take back to your room to eat, and you can use the well-stocked kitchen to snack at other times. It’s your responsibility to make your bed, clean your room, do your dishes, and take your towels and bedding to the laundry at the end of your stay. There is no TV, phone, cell service, or internet, so you are completely cut off. Your room isn’t locked. Not my usual travel expectations, but perfect for this experience where I wanted to simply reflect on what I really need and want in life. The monks from the Order of St. Benedict are a great bunch, and I’ve always admired their particular tradition of contemplative spirituality. They find a lot in common with eastern meditative traditions like Buddhism, and in fact, the Hermitage bookstore is filled with books on other faiths, particularly Buddhism. There were even books that I considered too new-agey for even my granola-munching legal-cannabis-toking Californian mindset. I was still a little surprised to find a Dhammapada in my room, in addition to the Bible. One of my favorite authors, in addition to Trappist monk Thomas Merton, is Benedictine monk David Steindl-Rast, who coincidentally spent some time at the Hermitage. Steindl-Rast has studied and written extensively on the commonalities between aspects of Christianity and Buddhism, and even has a fantastic TED Talk on the power of gratitude. Pretty spry guy for being over 90, eh? If you just have a couple more minutes, skip the rest of this post and go watch his talk. I devoured several books by Steindl-Rast, Merton, and Thich Nhat Hanh on this trip. I’ve long felt that a regular habit of intentional reflection is a very powerful component of effective leadership – both professional and personal. Back in my corporate days I’d take my executive staff offsite for a quarterly retreat where we’d spend the morning reflecting on how we were doing vis-a-vis our principles and strategies, then in the afternoon we’d spend time together interacting on a more personal level, which is when some of our most brilliant ideas arose. Having it at a winery a mile away, with the free-flowing amenities you can imagine, helped everyone feel comfortable participating. Before I go on a retreat I set some goals and create a rough schedule. This time I wanted time to reflect on various aspects of my life – personal, professional, health, friends, family, and so forth. I also wanted time to do quite a bit of reading, and I especially wanted time to just sit. It’s in those times of sitting, in solitude and silence, when I often have the greatest insight. Jon Miller has written several articles on tips for doing hansei – reflection – which I also reviewed. Over those four days I took nearly thirty pages of notes in my journal. I had several insights on how issues I thought were a big deal were in reality far less significant, and on aspects of my life that I thought were unimportant really should be more important. I reviewed old goals and created new ones, decided on activities to start, and perhaps most importantly, what I should stop doing. One of my favorite books, Greg McKeown’s Essentialism, was part of my reading at my reflection in Panama a couple years ago, and the concepts have stuck. I did meet with a monk for “spiritual guidance,” but in my case the guidance was directly related to my reflection. He was intrigued with my reflection process (because, done right, it really is a defined process), and offered a great suggestion to take time to intentionally reflect again on the thirty pages of notes from my reflection. I took his advice, and after a few hours I had a new distilled and condensed set of notes that added even more clarity and direction. That second level of hansei is something I’ll incorporate into my regular reflection from now on. As is usually the case, my wife immediately noticed the difference when I returned home. She knows how important this process is to me and encourages me to take a few days alone every so often. Or maybe she just enjoys having the house to herself for a bit. Do you have a process of personal reflection? If so, is it really a defined and intentional process? I believe it is a critical component of effective personal and professional leadership. Consider my process and Jon’s tips I linked to above, but it’s important to make it your own. Then take some time and reflect. You’ll be amazed at what you learn and the clarity it creates. If you’re up for it, try doing it in silence, perhaps at your nearest monastery! But you’ll find it really hard to beat the view at the Hermitage!